Big week, guys. This little girl got her first big girl TRI BIKE! After two wonderful years of riding my trustworthy Specialized road bike (which I plan to keep for cruising), I made the decision (with the help of my coach) to take my training to the necessary next level. It’s not even like I had a choice. I mean, doing an Ironman on an aluminum road bike with no aero bars put me in the beginner/crazy girl category. Crazy because if I want to do this race and be fast yet comfortable, I have to reassess and reposition my situation. This wasn’t a thought out plan. I actually just assumed I’d snap some aero bars onto my road bike (and barely use them because I’m scared to) and get a few more water bottle cages for that long ride. No one seemed to be like “hey girl, you’re not riding that, are you?” so I figured I’m good. Ehhhh. Wrong. On Tuesday night, that all changed. Just after the big purchase. 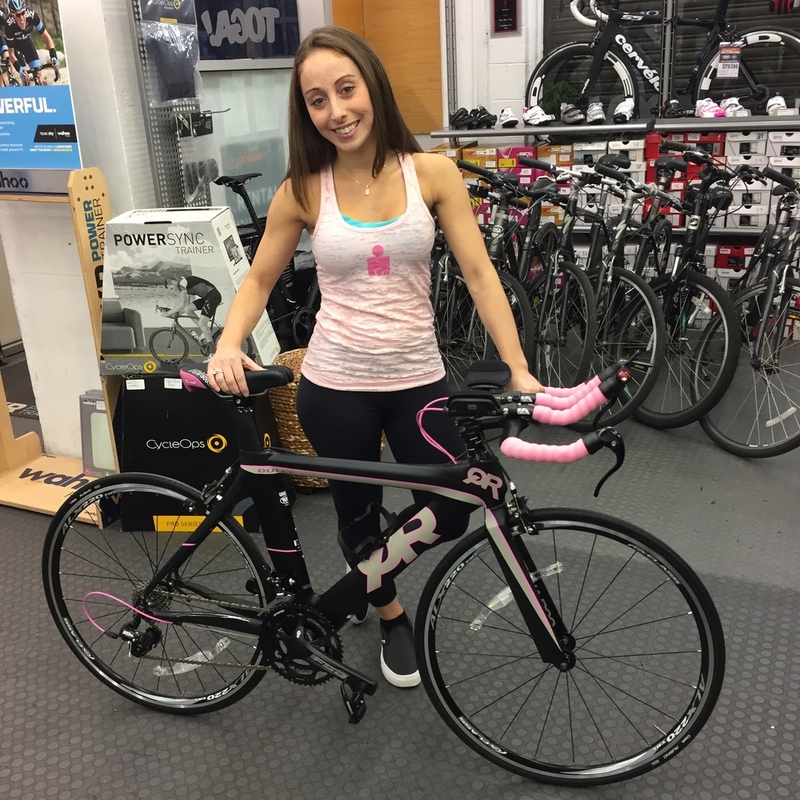 The wonderful folks at Toga Bike Shop on the upper west side of Manhattan teamed up with T2 Multisport NYC (my cycling homebase) for a shopping night exclusively for T2 clients (which includes the Terrier Tri team) and offer us up to 20% on bikes, gear and such. No brainer. I knew I needed some new inner tubes for my wheels and maybe some cycling tops, but I didn’t walk in there thinking I was going to walk out with a bike. But when I walked in, my eyes went right to the racks. The lovely Rachel, who works for Specialized, was kind enough to show me some great bikes for women, some that were road and some that were tri. All were made of carbon fiber. Let’s get one thing straight - aluminum needs to go if I want to change the name of the game. After seeing such wonderful choices, my coach caught me eyeing one road bike in particular, and he goes “NO, I want you on a tri bike. Absolutely.” At first I assume he was joking so I laughed, but then recognized his face and it was clear he was not playin' games. I kept stating how unprepared I was and that this may be my only Ironman. (But honestly, I’ve been saying “this is my last” for years). “You’re ready,” he said. And I wouldn’t believe it from anyone else. So with a heart beating at a new pace, I said OK, LET'S FREAKIN' DO THIS. Then I hear an AH-HA. There is ONE small frame to fit mini me! It’s a Quintana Roo Dulce - the only in the line that comes in an extra small size. Right away, I loved the colors - black and pink with a hint of gray. I thought, if Barbie had a tri bike, this would be it. So I just bit the bullet and handed over my credit card. It was time to take this journey to the next level. Eek! I woke up Friday morning and put on my Ironman pink tank top in anticipation of picking up my bike later that day. (Matching is everything!) 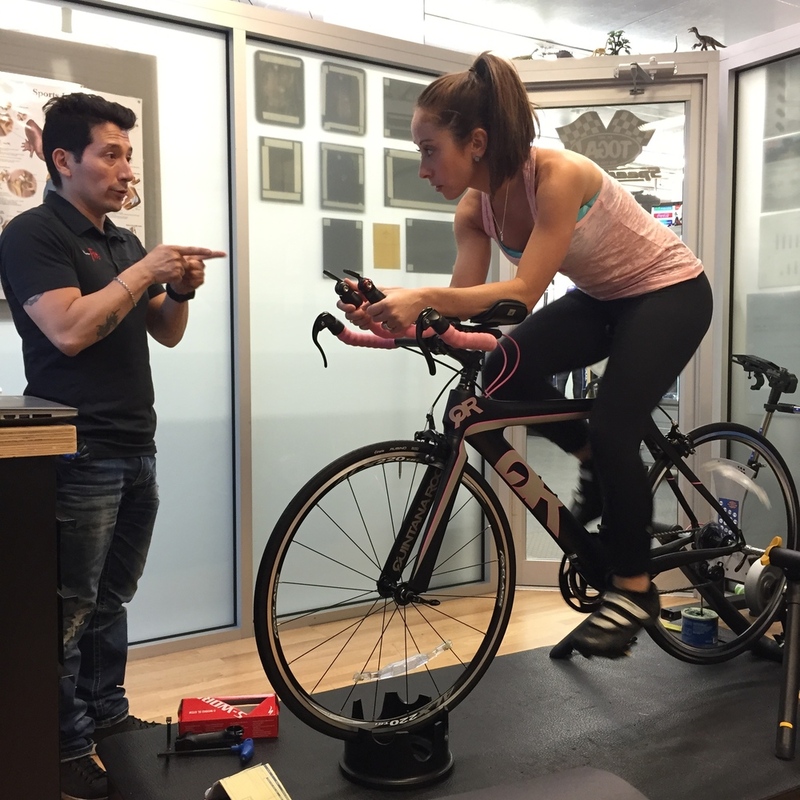 When I got to Toga, bike specialist Will unveiled my new ride and set it up on a trainer to start making some adjustments based on a few tests we conducted. We made sure my arms fit comfortably in the rests in aero bars and that my knees had an ever so slight bend to them as I picked up my cadence. Being in the aero position on the trainer felt fine, but I knew then and there that I would have a lot of work to do to get myself ready to ride on those mean streets of NYC. My husband's unused bike needs to step aside and make some space for Barb! My husband accompanied me as we walked the bike to our apt 15-minutes away. When we got home, it hit me. There are now more bikes than humans in our home (3). That is not a predicament I ever thought I’d be in. It was also then that I realized I had a name for said bike. I am calling her Barb, named after my late grandma Barbara who loved pink and was one heck of a sassy woman. And what’s super fitting is that my road bike is named C.C. (stands for Cavalier’s Choice) after my grandfather’s winning horse. So my granny & gramps are back together and it’s making me ever-so happy. The next morning I knew I had to ride this sucker to T2 for our Saturday morning computrainer ride. Might as well get started on this thing ASAP. I rode there in sneakers in case I wanted to jump off and kept my hands on the regular handlebars. I shifted into aero position for a I think 2-seconds and I think my heart stopped. SO SCARY. I can’t imagine holding that for 7 hours during an Ironman. Another Eek there. On the computrainer, there was another scary realization. It dawned on me that because my bike positioning has shifted, so has my strength. I was pedaling hard but it looked like my power was much lower than usual. My body weight is being distributed differently on the tri bike, therefore I have to somewhat re-learn to cycle. My thighs are essentially hitting my core with every stride, placing me in what feels like a pike position, so my breathing was heavier and my quads were doing a lot more work than usual. I left class feeling quite bummed. I know these are all learning curves but I have very little patience. I guess I’ll need to change that! **If you’re considering purchasing a bike, keep in mind what you’re going to be using the bike for. My road bike was fine for long rides with friends, sprint and olympic distantance triathlons, even not horrible for my Ironman 70.3 which happened to have a relatively flat bike course. And for crusing, a road bike is essential. But if you’re considering doing a 70.3 or most importantly a 140.6 full Ironman, understand that a tri bike is designed to make you a more streamlined athlete, keeping you from catching the wind with a more aerodynamic position. Plus, it’s generally a smaller, lighter bike, which will get you through the course at top speeds. Lastly, it’s designed with the triathlete in mind, helping you ride in a position that will save energy for the run. It’s science…and it’s scary, if you ask me. But, hey, I have a new bike! And that is pretty darn exciting. Thanks for reading about my ups and downs with this new adventure. I’ll be sure to keep you posted on how it goes from here on out!